Though Cassini only has a few days left to study Saturn before it dies, it’s seriously making them count. Today, NASA released what it says are “the highest-resolution color images of any part of Saturn’s rings.” In true Cassini fashion, they’re absolutely mesmerizing. 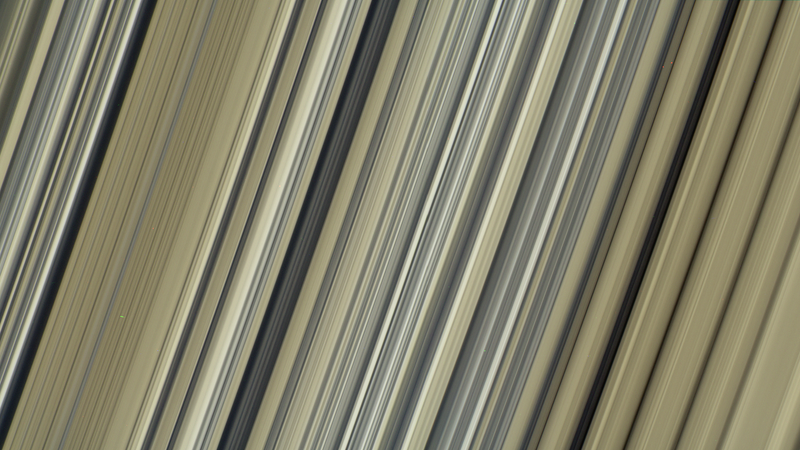 The above image, taken on July 6th, 2017, is a natural color composite of a portion of Saturn’s B ring. At the time, Cassini was whirling 47,000 miles (76,000 kilometers) away from this region. According to NASA, it’s unclear what material gives the icy ringlets a beige hue, which is typically hard to detect since Saturn is a similar color. It’s just one of those mysteries Cassini can hopefully help solve. Cassini’s d-day is September 15th, which means we only have a couple of days to say goodbye. Hopefully we get a few last stunning glimpses of Saturn before the spacecraft goes out in a blaze of glory.